the kids and i headed up to my parents’ house late sunday night. we joined 3 other families here, 3 families that my dad has grown up with, so now i have, too. since before i can remember, we have taken the last week of july/1st week of august and vacationed here at bass lake, even before we lived here full time. in more recent years we have also met at lake arrowhead and newport beach. even though i am without my sweet husband this week, it has been very relaxing for me. there are basically 5 grandparents other than my own parents who have been extremely helpful with all my kids, since they are the littlest by far. it has been such a blessing! i love that my kids get to bond not only with my parents, but also with folks who i’ve known since i was my own kids age. we’ve spent a lot of time here in the water, on the beach, around the table doing crafts or eating, or just lounging in general. we head home tomorrow after a pancake breakfast (yum! ), to a super messy house (due to a chaotic rush out the door) and guests arriving only a few hours after i get home! luckily our visiting friends are as close as family, so a mess won’t shock them. 10 comments for "a trip home"
a few months ago i was walking around my sister-in-law’s new house for the first time, oohing and aaahing at how she’s made her home beautiful and very her. the last room she took me into was her master bedroom and i gasped! 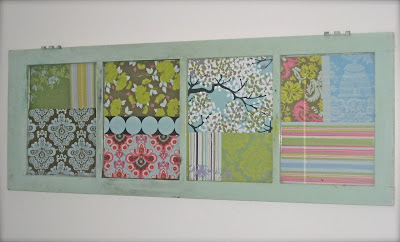 on the wall was this old window in the most beautiful shade of turquoise and she had filled the panes with random pieces of amy butler paper. i knew i had to do this, too. i had a similar, but smaller window that i have used as a coat hanger for years, i think since i first got married. i painted the frame a similar turquiose and finally got to papering the panes tonight. oh. my. goodness. was that so much fun! i get so caught up in making things for business purposes and rarely do stuff for my home that i forget how gratifying a quick little project can be. it makes me want to be more purposeful about dedicating time to pursuing my design interests away from business things. 20 comments for "papered window"